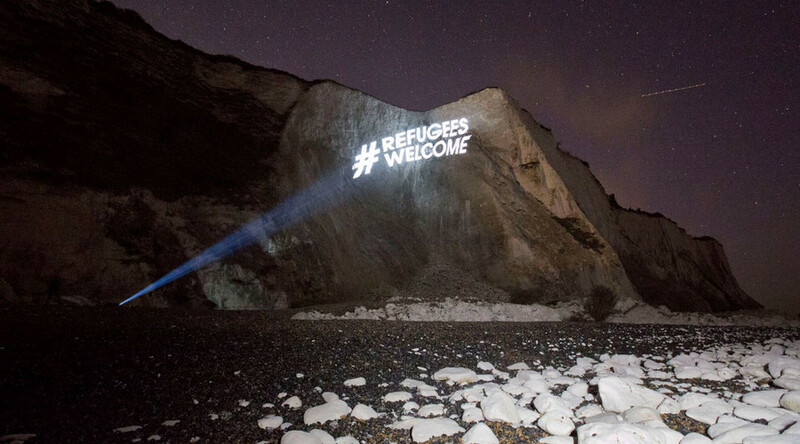 Campaigners have responded to an anti-immigration protest taking place in Dover this Saturday by projecting the words ‘#RefugeesWelcome’ onto England’s iconic southern cliff face. Violence erupted in January when rival protests clashed in the port town. Organized by Global Justice Now and “guerrilla projectionist” Feral X, the words could be seen atop the White Cliffs of Dover, just meters from where the anti-immigration protesters will meet on Saturday. Around 500 anti-immigration and anti-refugee demonstrators are expected to gather to protest against the government’s relocation of Syrian refugees. “Far-right groups are coming to Dover to fan the flames of hatred and xenophobia, often generating a lot of media coverage in the process. But across the UK thousands of groups and communities are acting in many different ways to offer practical and personal support to refugees who have fled desperate circumstances to get here,” said Global Justice Now director Nick Dearden. The Kent Anti-Racist Network, which is also planning a counter demonstration, will be bolstered with support from the London Anti-Fascist group, which is sending busloads of activists to show their solidarity. 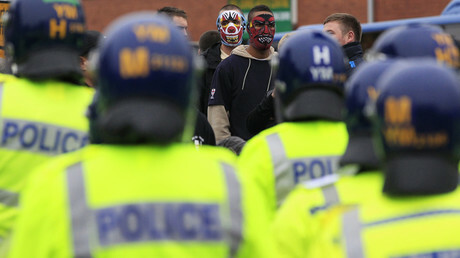 The port town saw violent clashes between rival protesters in January, with 32 arrests. In March the House of Lords defeated the government in a vote that could see 3,000 unaccompanied child refugees allowed into Britain. Labour peer Lord Alfred Dubs, who was himself rescued from the Nazis as a child, pushed for the amendment to the Immigration Bill, which was passed by the upper house. He called on the government to remember the Kindertransport, which evacuated Jewish children from Nazi occupied Europe.